Precious metals expert Michael Ballanger discusses silver's mercurial aspects. When I was a young lad, there was a classmate (let's call him "Frankie") in the very early years of my education whose behavior was quite often deemed as "peculiar" and while I found him immensely entertaining, the teaching staff and my fellow students did not entirely agree. Frankie was the kind of kid who would bang on our doorknocker on a frigid winter morning just before sunrise, fully clad in hockey skates, gloves and stick, and ask if he could skate on our frozen backyard hockey rink. The fact that it was a school day made it not exactly the brightest of decisions but my Dad would invariably say "Alright. You two boys have got 20 minutes then back in your houses to get ready for school." It was never an outright rejection on the grounds of unsuitable behavior; it was more so an accommodation for the simple reason that 20 minutes of hockey at 6:35 a.m. in advance of school was a "noble enterprise" and certainly beat watching Captain Kangaroo over a bowl of Fruit Loops. The second reason we silver bulls are constantly avoiding and evading the snapping jaws of the silver bears is that the major base metal mining companies are sitting on massive byproduct silver "slag heap" reserves that can be mobilized quickly (at least in a "hedging sense") in order to buttress the earnings profile of a copper/zinc mining operation. Again, if the algos or the bullion banks in New York and London are aware of a 500-million-ounce silver resource sitting a few hundred meters away from the main production adit of a BHP copper mine, you can bet your schoolyard swing pole that they will have the CFTC allow them to categorize those "reserves" as "hedgeable." If slag heaps containing non-43-101-complaint "reserves" are within three country miles of anything quantifiable, the bullion banks will take control of that "paper asset" and find a way—ANY WAY—to monetize it for the benefit of their quarterly P&L. 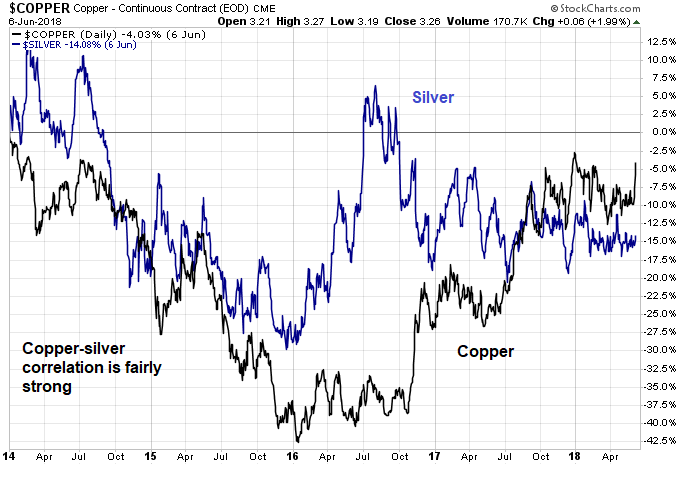 Despite all of the controversy and furor over the ongoing shenanigans in the precious metals arena, the biggest bet I made in 2018 thus far was selling the Gold-to-Silver-Ratio (GTSR) at 81.75 back in late March because while I was bullish on silver, I did not want to once again try to defy the history of technical "breakouts" and "breakdowns" that always seem to wind up in the "false" or "failed" category largely because of the role of the bullion banks. I instead elected to own silver (in size) but hedge it with a perfectly matched sale of gold—in effect "shorting" the GTSR at 81.75 at the time silver was trading at around $16.80. Since that time, both silver and gold and gold have declined but on a percentage basis, gold has been hit much harder, such that the GTSR currently resides at 77.00 for a gain of 6.16%.